Ooh la la Pin Up Sew- Along! Lingerie aficionados, Anna from A Few Threads Loose and Sarah from Ohhh Lulu team up to bring us the fabulous Ooh la la Pin Up Sew-Along. 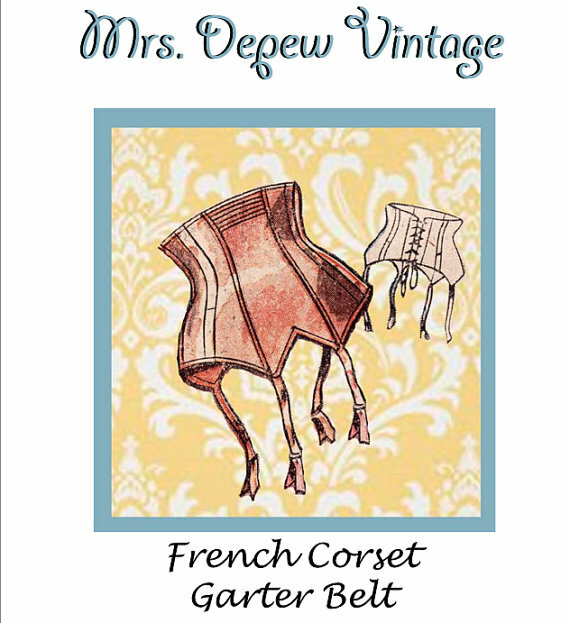 The sew-along begins with Anna's new pattern for this amazing French Pin-up Corset garter belt and continuing with her French Pin-up Bra Corselet. A proper garter belt is a must-have piece for me. It has good tummy support for smoothing out any bumps and holds up your stockings without the discomfort of a full girdle. Finding a nice garter belt that you can wear (and not a Fredericks of Hollywood in-the-bedroom item) is no easy task so I am very excited to be able to sew my own! I'm joining in the fun, for sure! Pj worked from 3am to 7am this morning so after he has a good nap and I've sized my patterns, I'm going to the fabric store for some lovely pink satin. 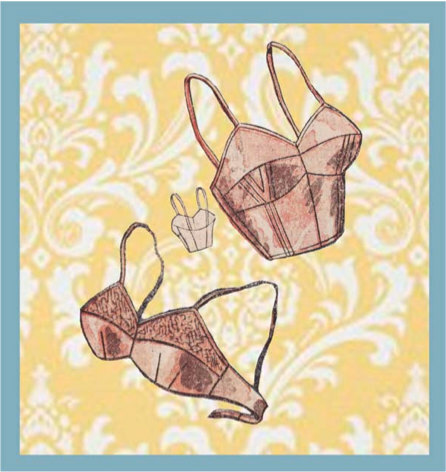 I have almost all of Anna's gorgeous lingerie patterns and have been wanting to begin making my own unmentionables for a very long time. I'm so happy that I get to begin today. 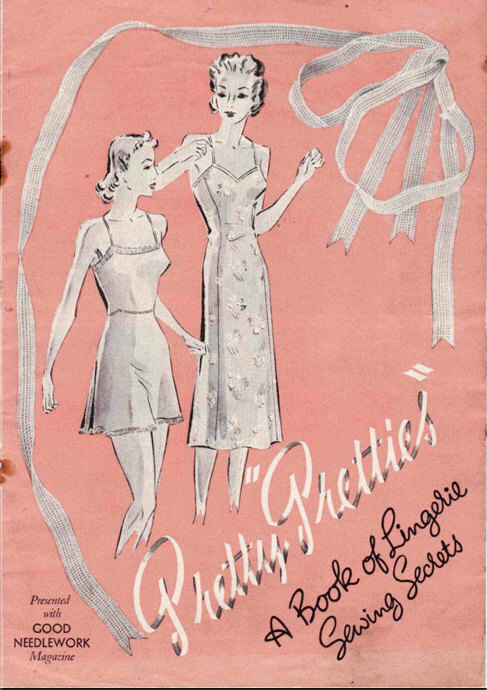 She sent me a copy of her 1940's Pretty Pretties booklet, which has a lot of information and how-to's on dainty details that you can do to add special touches to your handmade lingerie. Also on my must-sew is her beautiful vintage teddy pattern, which would be lovely to wear to bed on a hot summer night. 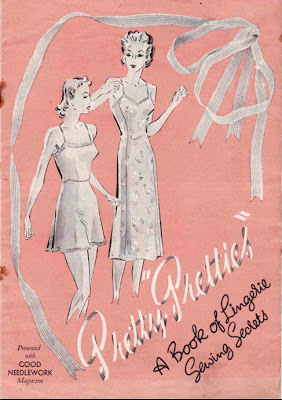 The Pretty Pretties booklet gives instructions for a shell-edged hem and lace inserts. I think that would be beautiful to do on the legs of the teddy. You can join in on the Ooh la la Pin Up Sew-Along at A Few Threads Loose and purchase the lovely sew-along kit (patterns for garter belt, bra and Pretty Pretties booklet) in her etsy shop, Mrs. Depew Vintage. Be sure to pop over to A Few Threads Loose for a coupon code for her shop and enter her giveaway to win the patterns for the sew-along! this looks like sew much fun! Just those few pictures are great inspiration! Super excited for you!!! Sounds so pretty!!! Yeahhhhh!!! xox PS It does look awesome for belly support-I wonder if one can wear those under trousers??? Oh boy, this looks like fun. 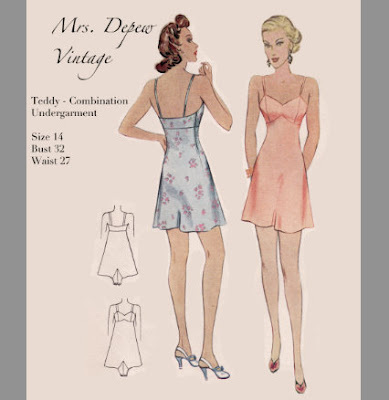 Such great vintage patterns...I am headed over to shop right now. This looks like such a good project that I wish I could sew properly!! Looking forward to seeing how you get along with this and to seeing the finished items. I just saw this and I'm quite fancying have a go actually! So I may join you! Very cute! I need all the belly support I can get...love this! Ah, French knickers, or 'easyfeels' as they are affectionately known in my family.